Currently Isamu rattery is permanent home to does only. Temperament: Moo is a lovely sweet licky girl. She is one of those rats that you meet and cant help but love. She very much takes after her name sake Mu in that she believes the world revolves around her and has the ability to really get and keep your attention (in your face isn't just a phrase with her). There's an awful lot of personality trapped in her petite body and this can lead to her being a bit too big for her boots on occasion. Story: Moo is one of my first does for a number of years, she comes from a litter which is a really special combination of Lovecraft and Isamu lines. It represents two of the best rats we’ve both bred and the entire litter was so special me and Lisa kept them all between us. Her name links back to her Grandma Isamu Honeymoon, who is a particularly special rat to both me and Lisa. Her name is very much representative of the joy these special girls bring. It also ties to her mum, as the writer of the song “shoot for the moon” was names Joseph Malone. *Best Dumbo and AOV dumbo. Status: Pet and former breeding doe. Moo gave me the wonderful Zamoo litter at 9 months old. Temperament: Summer is a sweet gentle, but exhuberant girl. She is very confident with people and new situations and is a very balanced loving girl. 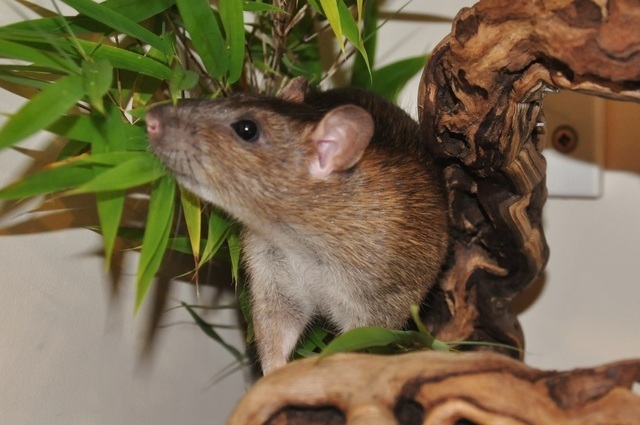 One of those rats that is a joy to be around and very uncomplicated. Story: Summer was born here to my beloved Moo, she stood out from a young age as being pretty, but soon won me over by being very into me as well. Her name reflects her summery nature as well as her warm light agouti and being born on the last day of summer. Temperament: Autumn is a mini Moo, she is cheeky, naughty and generally is the one you find has got somewhere she really shouldn't be (and knows it), she's very active and knows no fear when it comes to exploring new places, though is a little shy if strangers are around or something startles her. Story: Autumn was born here to my beloved Moo, she was my first "keeper" i picked out for her good looks and cheeky temperament, she has a slight ear waffle now but is still a lovely girl. Show Performance: Autumn has mostly been beaten by her sister at shows so whilst she has still usually managed 2nd she hasn't got lots of awards to show for it. Status: Pet - after trying for a litter twice with her she lost one mid term and carried another to term before safely reabsorbing. This is enough for me to try and she will live her life as a much loved pet. Temperament: Fuse is a really confident young madam, from pretty much birth she was pushing her brothers around, and she's not let growing up and moving in with the adults stop her. 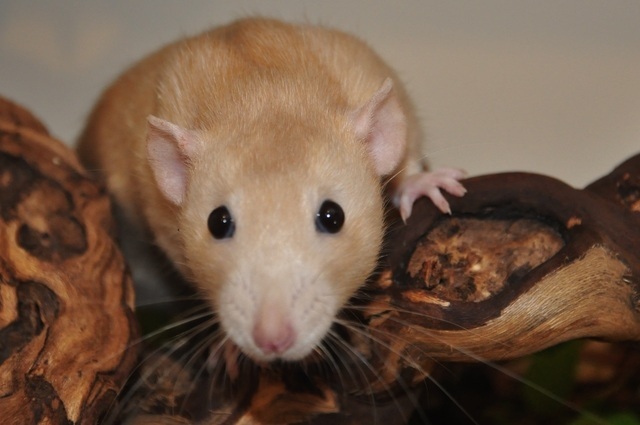 She is fast becoming one of those rats you can't help but adore, licky, cheerful and loves playing, she also has to be at the heart of anything going on. She optimises the Isamu temprement I breed for. Fuse is sadly retired from varieties showing after an accident where she broke her tail, she has recovered well but it has left a fair lump. Temperament: Sunny is a confident interesting girl. She loves exploring, is very active and fit without the manic blurr that is her sisters. She likes to visit me but is mostly obsessed with searching for food. Story: Sunny was born here at Isamu rats as a real surprise. I suspected Summer carried RED but didn't think Avanti (the dad) did. So finding 4 gorgeous Topaz rats in the litter was a wonderful surprise. Sunny was the prettiest topaz and a real settled character which reminded me of her great great grandma Honeymoon. Show Performance: Sunny has done quite well at the one show she has been to getting best AOV dumbo kitten. Its early days yet and she's only been entered in one show. Health: Sunny has unfortunately got an unseal digestive condition which sees her respond badly to certain foods (seemingly oily fish and fish oils). Currently we are investigating it with the vets help and it is well under control with appropriate diet but it does mean i wont be breeding from her. 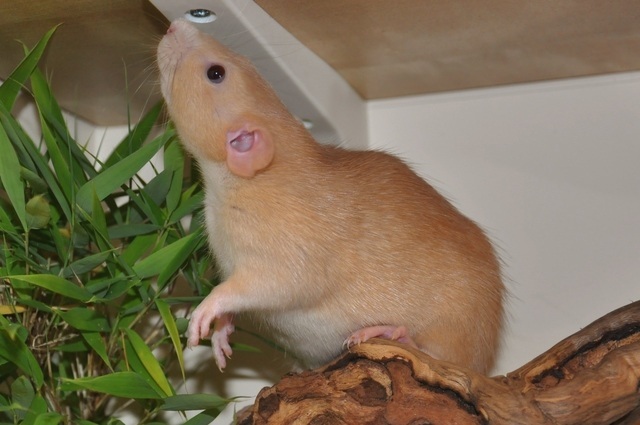 Temperament: Beans is a manic explorer, showing from a young age that nothing was a barrier to her. She likes people a lot but new things and places are that bit more exciting. She is a real character and very fun to play with. 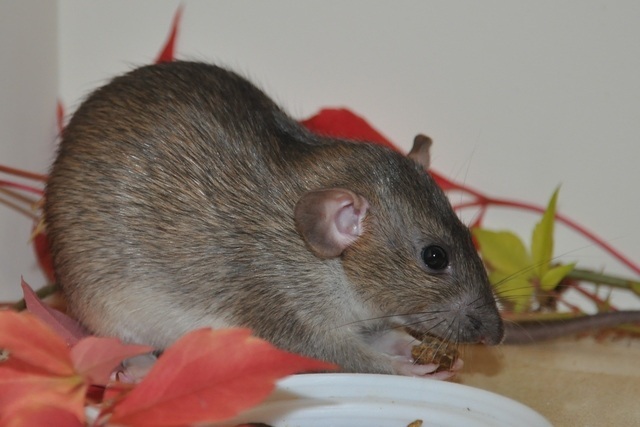 Story: Beans was born here at Isamu, I was very keen to have a top eared agouti having got a real hole in my cage, however i knew I would have to make the best strategic choice. She soon grew into the prettiest doe in the litter and more importantly managed to defeat my baby free range proofing on several occasions and calmly explore the whole rat room with the adults much to my horror (both her and the adults quite enjoyed it). From then on i knew she'd be a keeper. Show Performance: Beans has won Agouti kitten a couple of times and managed 4th overall in a very big AOV class in her short showing life. She has also won agility on her first go, hopefully following in her Aunty fuses footsteps. 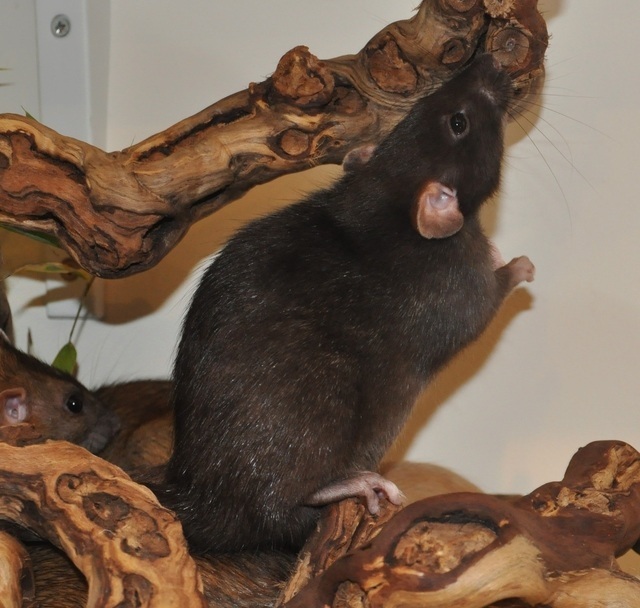 Temperament: Diddy is just one of those rats, you cant help but love her from the moment you meet her. She's silly, affectionate and playful. Free range and her fave game is being tossed onto a cushion, after which she races of skips into the air and races right back for more. She's a real heart rat and i adore her. Story: Diddy was born here at Isamu rats in my Vantum litter, however she was the smallest girl. 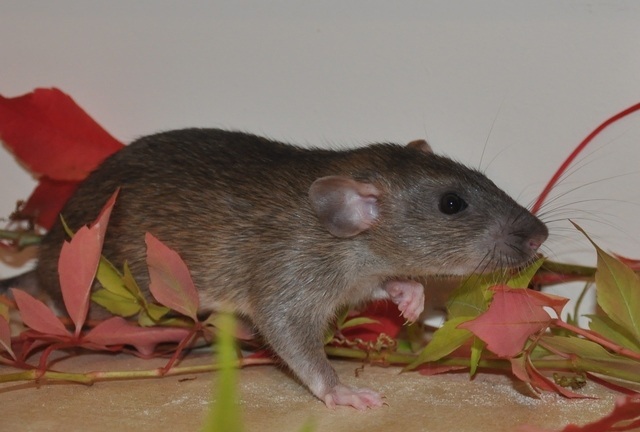 When a litter at Lovecraft rats were still born and the mum was distraught I sent 3 little babies over to her so that Fallow could have some babies. It was a risk but there was a back up small litter there only a day older. It worked out beyond our best hopes, Diddy and her sisters thrived and ended up bigger than the 10 still here. I wasn't intending to keep Diddy, however when I went to visit them one last time before homing she chose me, and I couldn't not have her. Show Performance: Diddy has got best opposite age at her first show, and more impressively reserve best pet. Not bad for only 10 weeks old. Health: Diddy did go through an outbreak of Sendai as a baby so suffered some respiratory problems during that. However she pulled through fine and has shown no other issues since. Status: Pet and possible breeding doe. Note: with all RED rats here Diddy will have a nick test carried out prior to consideration for breeding to test her blood clotting times. Only those within normal ranges will be bred from.